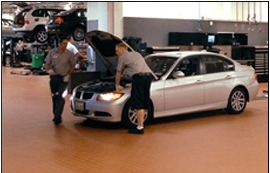 We'll Match Any BMW Certified Shop's Repair Estimate. All Repairs Guaranteed for 3 Years or 50,000 miles. No matter where or when you bought your BMW, BMW Des Moines delivers after-warranty repairs and BMW maintenance at independent repair shop prices. You'll get the same high quality attention from our BMW trained and authorized auto technicians as you can expect when you buy brand new. It's important to keep your BMW in top condition to get the best resale value possible for your BMW. Kelley Blue Book awarded the BMW X5 xDrive35d Best Resale Value in its class and the 2010 BMW M3 one of the Top 10 cars with Best Resale Value. For routine BMW maintenance like oil, coolant, filters, brake repair, BMW pads, car and BMW key memory -- large or small repairs, our top mechanics will keep your BMW on the road and finely tuned. Make an appointment now and indulge your BMW with attention it deserves.